Dr. Walter Wendler, President of West Texas A&M University addresses an issue on campus. We at the Amarillo Branch NAACP thank Dr. Wendler for handling this issue quickly and working with the branch. Noted below is a letter I submitted to the Amarillo Globe-News on Monday in response to an article published in the Saturday, Sept. 22 edition. The article reported an incident that occurred this summer by an SSC Service Solutions employee toward another SSC employee. It involved a racist symbol directed at the victim. The incident was dealt with and the employee was terminated. West Texas A&M University does not tolerate such behavior and accepts all who come to campus to work or visit as equals, and everyone is treated with the utmost respect. This is the spirit of campus, and each member of the WT family should emulate that spirit. It is the Buffalo Way. The Lisa Carr story on the front page of the Amarillo Globe-News on Saturday, Sept. 22, 2018 is unsettling to me. Not because there is factual inaccuracy in it. It is factually accurate. Rather, it is because West Texas A&M University does not accept the kind of behavior reported. When the incident came to our attention, within a day we investigated it and found out that a contract employee was involved, not a WT employee. We reported the incident to the contractor and stated that it was unacceptable and the person who carried out the reprehensible deed will not be allowed on our campus. Inaction would be inconsistent with the values we aspire to at West Texas A&M University. Within a few days, the perpetrator was identified and no longer works as a contract employee at WT. In less than a week a decisive conclusion was reached and action taken by the contractor. West Texas A&M University expects better of private contractors on our campus. This incident will weigh in any future contract negotiations, and we expect this to be the last time we see anything like this from any private contractor who works on our campus. 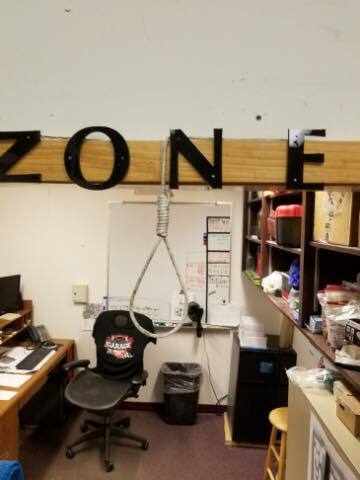 If a staff member employed by WT were involved in such deplorable behavior, termination would immediately follow. No one associated with WT, in any way, can expect anything less from our University. Such action does not represent the values of the people of the Texas Panhandle as I have come to know them and is unacceptable and inexcusable to me as president of WT. If you need email content or attachments in alternate formats for accessibility, please send your contact information and the details of your request to accessibility@wtamu.edu.